High molecular weight hyaluronic acid (HA) is a natural physiological constituent of connective tissue. It plays a critical role in the collagen-making process. Made up mostly of collagen, it is one of the major components of the human body. 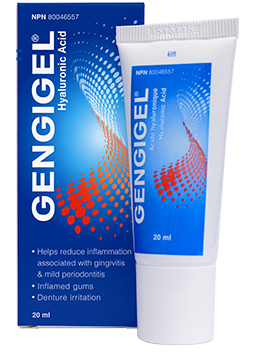 HA is the most abundant high molecular weight glycosaminoglycan of healthy soft periodontal tissues.4 It is active in tissue regeneration and influences the migration of fibroblasts and fibrinogenesis, thus making the healing of tissue easier. It performs 3 synergistic effects: anti-inflammatory, accelerates the healing process and provides a protective barrier.